These two exclusive rights of copyright are at the heart of the worldwide business of music. They involve musical compositions and sound recordings, the rights of copyright owners and limitations on those rights and how creators and copyright owners are compensated. In the world of traditional media – radio and television primarily – the music licensing process has evolved into a fairly straightforward process. For musical compositions, writers and music publishers join or affiliate with ASCAP, BMI or SESAC (performing rights organizations/PROs) who negotiate license agreements for the use of music, collect the fees and distribute them back to writers and publishers who have performances in specific media. If the PRO and a user cannot come to an agreement as to license fees, courts intervene and determine “reasonable fees” for music use. In the area of sound recordings, performances on traditional over the air radio are exempt from royalties and considered as “promotional” tools to drive sales. A record company’s main source of income, other than record sales, comes from the licensing of master recordings to television series, feature films and advertising commercials among other uses. And then came the online/digital world – or technological revolution that changed everything. A rather simplistic view of the music business but one that serves as an appropriate starting point for an increasingly changing and complex business. Music licensing in the digital/online space has been, from inception, in a continuing state of evolution as to what is actually licensable, who is entitled to negotiate and collect license fees, how will royalties be distributed once collected and what is the value of music in all of the new configurations and business models. The primary rights involved in these discussions are the mechanical right and the performance right (songwriters, composers and music publishers) and the sound recording performance right (recording artists and record companies). Though there remain some major unresolved issues, particularly in the musical composition performance area, overall ground rules as well as precedents appear to be taking hold creating a more stable environment for creators, music business entities and music users. Most countries of the world exist in a world of 2 copyrights in music transactions-the copyright governing the underlying musical composition (the song) and the copyright governing the sound recording (the record). The scope of rights involved in each of these separate copyrights are primarily the jurisdiction of national legislatures with the meaning and scope of these rights normally handled by each countries judiciary-whether it be courts, tribunals, copyright boards or other designated bodies. Negotiated voluntary agreements between the users of music (webcasters, broadcast television, cable, radio, satellite, etc.) and large organizations organized to negotiate and collect for multiple copyright owners (performing right organizations, mechanical right organizations, sound recording organizations, etc.) or individual copyright owners themselves play a major role in deciding what the license fees should be as well as what the scope of the license is in any media. In situations where voluntary license agreements cannot be reached by the parties, federal rate courts (e.g. ASCAP and BMI in the U.S.), Copyright Tribunals (e.g. PRS for Music in the U.K., APRA and AMCOS in Australia and New Zealand) or Copyright Boards (SOCAN, CMRRA and SODRAC in Canada; songwriters, music publishers, record labels, websites, artists, etc. in the U.S.) decide the issues and determine rates. At the time the Internet was just taking hold by consumers, the music business throughout the world had a long history of established rules and negotiations governing licensing and the establishment of rates. Though many of these license negotiations were restricted in the sense of territory and term, among other items, many were not (i.e. grant of the worldwide distribution right in feature film licenses). In the area of the song, integrating the internet into licenses by copyright owners (music publishers normally) was significantly easier to accomplish than integrating master recordings. In the U.S., Copyright Royalty Judges already had a history of dealing with the setting of rates in many areas and the 2008 CRB hearing regarding the "mechanical rate", showed that the setting of rates in the online world was not only doable but also a reality. In October of 2008, U.S. Copyright Royalty Judges, “In the Matter of Mechanical and Digital Phonorecord Delivery Rate Determination Proceeding,” set the physical and download statutory license rate to be paid to songwriters and music publishers for the period 2008-2012 at the larger of 9.1 cents or 1.75 cents per minute of playing time with the ringtone rate at 24 cents. In addition, a late payment fee of 1.5% per month was put into effect. Both the ringtone rate as well as the late payment fee were appealed with a June, 2010 decision by the U.S. Court of Appeals for the D.C. Circuit affirming both. The Royalty Judge proceeding decision was interesting as it incorporated a private settlement between the parties regarding the rates for limited downloads and interactive streaming (on demand streams). This settlement took into account a service’s revenue, applicable service type minimums, PRO royalties (ASCAP, BMI, and SESAC) and a per subscriber fee to arrive at a per work royalty allocation. In 2012, the NMPA, RIAA and DIMA entered into an industry wide agreement for the period through 2017 for new rates regarding the 2008 configurations as well as new configurations which came into existence subsequent to the 2008 agreement. The agreement was submitted to the Copyright Royalty Judges who approved the new deal effective January 1, 2014. The new royalty bearing categories for music publishers, songwriters, composers and lyricists are Paid Locker Services, Purchased Content Lockers, Limited Offerings, Mixed Service Bundles and Music Bundles. The rates for the new categories involve the greater of a percentage of service revenue, total content costs (payments to record companies for sound recording rights) and, in the case of limited offerings, a per subscriber figure. The 2008 category rates and formulas for physical product sales and downloads, limited downloads, interactive streaming and ringtones remained the same under the new agreement. On the record side, there has not been a long history of collective licensing efforts. A copyright for sound recordings came into effect in 1972 in the U.S. (long after the 1909 Copyright Law and exclusive rights for musical compositions) with the 1st recognition of a performance right in sound recordings coming in 1995 and 1998 via the Digital Performance Right in Sound Recording Act and the Digital Millennium Copyright Act-and then the right was a limited one applying primarily to websites, satellites and cable and not to terrestrial broadcasting. The industry's approach for many years was to sue infringers in the online world-an approach generating among consumers not the best of publicity or results. The labels not only were slow to appreciate the fact that the physical world of sales was quickly disappearing but also did not have the history of different types of licensing negotiations and alternatives that the "song" copyright community had experienced over many years. In recent years, U.S. Copyright Royalty Board decisions have been of help in determining the online value of sound recordings. The webcaster decisions alone have established industry wide fees and rates for non-interactive websites as well as a compulsory license in the field. Rates are either per song/per listener or a percentage of revenue or a percentage of expenses coupled with minimums. For the period 2011-2015, the Copyright Royalty Board rates for FCC broadcaster simulcasts, commercial webcasters and non-commercial and non-commercial educational webcasters are either a "per performance" rate with minimums per station or channel or a minimum only depending on the number of aggregate tuning hours streamed. In addition to the CRB rates, SoundExchange, the sole entity designated by the Librarian of Congress and the Copyright Royalty Board to collect and administer the royalties due from non-interactive webcasting, digital cable and satellite transmissions, and satellite audio services, was given the authority by Congress via the Webcaster Settlement Acts of 2008 and 2009 to negotiate agreements separate from those set by the CRB giving many licensees a choice of rate structures to choose from. By choosing the SoundExchange rates, which run through 2015, one is precluded from choosing any of the CRB set rates. Recent SoundExchange agreements include Sirius XM Radio, College Broadcasters, the Corporation for Public Broadcasting, the National Association of Broadcasters and certain “Pureplay” webcasters, among others. On the interactive side (user selects the music they hear), individual negotiations prevail as sites must negotiate with the sound recording copyright owner as to what the fees should be. Some examples of the progress in this area are deals involving a percentage of gross revenue from subscribers and advertisers or a percentage of a net figure (gross minus certain expenses) with the resulting figure shared by the label with artists either on a contract royalty percentage basis or a 50/50 license split. Payments to the labels are based on their pro-rata share of activity on each site or by each licensed entity. In the world of the musical composition performance right in the United States (ASCAP, BMI and SESAC), negotiated industry agreements have been the norm with federal rate court alternatives (mandated by Consent Decrees entered into in 1941 with the government) coming into play only when ASCAP or BMI could not come to an agreement with a music user as to "what a reasonable license fee should be". The Decree also allows any party to apply to the Court (whether or not there were any prior negotiations) and upon such application to be able to perform music for fees to be determined later. This rate court option has been in effect since 1950 with ASCAP and 1994 with BMI and represents a primary way to resolve disputes and set collective licensing rates when the parties cannot reach an agreement. SESAC, the smallest of the 3 U.S. performance right licensing organizations, is not under a Consent Decree with the government nor does it have a rate court alternative; issues which are currently being discussed as part of a Southern District of New York Sherman Act antitrust action brought by a class of local television commercial broadcast stations entitled Meredith Corporation v. SESAC. Another case brought by radio broadcasters involves some of the same issues. In the online world of music licensing, the ASCAP rate court (Southern District Court in New York) has been instrumental in deciding what the license fees should be in the online world as well as what is actually licensable by U.S. collective licensing organizations. In recent interim and final decisions involving music use by AOL, Yahoo, Real Networks, AT&T, YouTube, Verizon and others, a percentage of revenue formula has been applied taking into account, among other factors, the amount of time music is performed versus the amount of total time spent on the site for all reasons- a business unit's revenue adjusted by a music use adjustment factor multiplied by a court set percentage figure (2.5% in the initial decision). An important issue in the ASCAP rate court cases was whether a retail wireless communications company required a public performance license for musical compositions because it provides ringtones to its customers (In Re Application of Cellco Partnerships, D/B/A Verizon Wireless) and whether the downloading of a digital file embodying a song constituted a public performance within the meaning of the U.S. Copyright Act (17 USC Section 101) (In The Matter of the Application of AOL, Real Networks and Yahoo for the Determination of Reasonable License Fees). Though the reasoning for the two separate decisions was somewhat different, both decisions by two separate Southern District Court of New York federal judges ruled against the existence of a performance right in each situation. ASCAP filed a petition for certiorari with the United States Supreme Court on the issue of whether a digital download of a music file constitutes a public performance under the Copyright Act but the Court refused to entertain the case. There was some language in the 2009 AOL/Yahoo/Real Networks decision and final order which left open the possibility of a performance right in certain situations but the current state of affairs in the U.S. basically denies a performance right both in a download and a ringtone. The court did recognize the fact that a mechanical right is involved in a download of a song and in a ringtone and referred to the Copyright Royalty Board 9.1¢ writer / publisher song download rate and 24¢ ringtone rate as appropriate compensation for these type of uses. These decisions did not deal with the issue of ringbacks as there is not a download involved. Accordingly, ringbacks are licensable by performing right organizations. The ramifications of the “no performance right in a download” ruling in these rate court licensing cases goes far beyond U.S. borders as practically every other major country of the world recognizes a performance right in a download which puts U.S. court decisions 100% contrary to the laws and practices of other country jurisdictions. In many of these countries, the separate mechanical right and performing right (referred to as the reproduction and communication right in some countries) are many times combined in a single joint license which provides the user all of the rights it needs without having to argue the distinctions between the separate rights of copyright. For example, PRS for Music in the U.K. issues gross revenue combined performance and mechanical licenses for music downloads (8%), music on demand services (10.5%), webcasts (6.5%), interactive webcasts (8%), and single artist webcasts (10.5%) among others. These licenses also include minimums. In Canada, pursuant to a Copyright Board decision, the total value of the bundle of rights (communication and reproduction) is 12.2% of the price paid by the consumer and or subscribers. The amounts are allocated between SOCAN (the performance rights society) and CSI, a joint venture of CMRRA and SODRAC (the 2 mechanical right societies) and are divided between the societies depending on whether the activity was a permanent download, a limited download, or on demand streaming. A 2012 Supreme Court of Canada decision (Entertainment Software Association v. SOCAN/CMRRA/SODRAC) though overruled the Copyright Royalty Board of Canada and decided that there was no performance right (communication right) in a download. As this decision only involved downloads, streaming situations still involve the licensing of both rights. An additional important issue and ruling came via the AT&T Wireless f/k/a Cingular Wireless ASCAP rate court litigation to determine reasonable fees for a blanket license for the public performance of copyrighted music via wireless and internet transmissions by a cellular telephone communications provider. AT&T had moved for a summary judgment on the issue of whether ringtones and ringback tones constituted fair use within the meaning of the U.S Copyright Act, 17 U.S.C, 101. The Court reviewed the factors to be considered as to the use made of a work and concluded that the use of previews was not transformative, that the use is commercial and that “traditional and reasonable markets existed for the license of preview performances and other short segments of copyrighted music. Therefore, the court ruled that previews do not constitute fair use and denied the motion in its entirety. The resolution of this issue was important as ringback and ringtone previews were taken into account in both the 2010 AT&T Mobility and 2011 Verizon Wireless ASCAP settlements where a rate of 2% of the price for all ringbacks sold was agreed upon. Excluded were tones directly licensed, or acquired from others who already had a license or where record companies had acquired the performance right. In May of 2010, a decision was rendered in the ASCAP rate court case involving MobiTv. In May of 2008, ASCAP applied to the Court to set a reasonable rate pursuant to Mobi’s license application to ASCAP with a bench trial being held in April of 2009. The issue involved what is a reasonable fee for the delivery of television and audio programming to mobile telephones. The court determined in this case that a reasonable fee for a “through to the audience” license for Mobi for the years 2003 through 2011 was a revenue based fee multiplied by 4 specific percentage numbers based upon the type of content. This fee structure was a combination of the 2007 AOL / RealNetworks / Yahoo rate court formula (January, 2009 final order) of 2.5%, the ASCAP/Music Choice 2.5% of gross revenues agreement and the ASCAP 1990’s post Turner litigation settlements regarding the cable industry where the percentage of revenue fees were based on the music intensity of the programming. Specifically, the court ruled “the revenue base upon which the licensing fee will be calculated is (1) for the content that Mobi licenses from content providers, aggregates, and conveys to wireless carriers, the amounts that Mobi pays to the cable television networks or other providers to license the content, plus any revenue from advertising Mobi inserts into that programming; and (2) for the music video channels and any other channel programmed by Mobi, the payments Mobi receives from the wireless carriers for those channels, plus any revenue from advertising that Mobi inserts into that programming. The rate to be applied to that revenue base is 0.1375% for news and sports content; 0.375% for general entertainment; 0.9% for music intensive programming, to include Mobi’s music video channels; and 2.5% for all-audio offerings.” In October of 2010, ASCAP filed an appeal of this decision to the 2nd Circuit Court of Appeals. It is important to note that the MobiTv percentage of revenue figures (Turner/Music Choice) were subsequently agreed upon in both the AT&T Mobility (CV Service) and Verizon Wireless (V Cast and ALLtel Licensed Services) ASCAP final settlement agreements. In September 2010, the Second Circuit Court of Appeals in the ASCAP/Real Networks, Inc./Yahoo! Inc. rate court case (AOL had previously settled with ASCAP) issued the first appellate decision in the string of online music licensing ASCAP rate court cases. The Court affirmed that a download of a musical work does not constitute a public performance of that work and further, it vacated the District Court’s assessment of fees (2.5% music use adjustment factor formula) for the ASCAP blanket license and remanded the issue for further proceedings. As to the “download issue”, the Court concluded that there was no “contemporaneous perceptibility” necessary, in the Court’s mind, for the existence of a performance right in the transfer of a musical file. As to the royalty rate formula, the Court of Appeals felt that the District Court “did not adequately support the reasonableness of the 2.5% royalty rate applied to music use”. The Court did not specify a particular method of developing a formula for music use revenue by the District Court in the remand but did suggest a number of considerations and approaches that might be helpful in arriving at an appropriate formula. Among them were valuing each of a services different types of music uses separately and then applying a “blended uniform rate and revisiting it periodically” as well as a variation of the BMI license utilizing multiple revenue categories apportioned into “buckets” and applying different revenue percentages to each. The latter an admittedly complicated and complex way of doing things. The Court also looked at the ASCAP/Turner agreement which involved different revenue rates based on varying music intensity as well as the 2.5% of gross revenue Music Choice/ASCAP negotiated agreement in addition to other past different media agreements by PRO’s and music users. Subsequent to this decision, the parties settled the remaining issues. In the online world of music licensing, the ASCAP rate court has been instrumental in deciding not only what “reasonable” license fees should be in this area, but also what is actually licensable by the U.S. PROs. Interim fee and final fee decisions have involved many of the biggest players in the “new media” world and have resulted in license fees significantly below what the PROs and copyright owners (music publishers, primarily) were requesting. To put the online fees into perspective, ASCAP, BMI and SESAC collected approximately 1.4 billion dollars in domestic U.S. license fees (radio, broadcast television, cable, live, etc.). Of this amount, approximately 100 million dollars was generated from all online/digital uses. The AOL/Real Networks/Yahoo case ruling and major worldwide significance as there was a summary judgment ruling that the downloading of a music file did not constitute a public performance under the Copyright Act- a ruling totally contrary to the laws of most other countries with the exception of Canada. The 2nd Circuit affirmed this decision with the cert denied by the U.S. Supreme Court. The Court also remanded the fee formula back to the District Court. The 2009 Verizon Wireless rate court case reaffirmed the AOL “no performance” decision in a ruling that stated that the transmission of a ringtone to a cellular telephone customer did not constitute a performance and that the mechanical ringtone rate of 24 cents per download was the only appropriate right involved. The primary issue of the 2009 AT&T case was whether previews of ringtones were to be considered “fair use” rather than licensable performances. The court ruled in favor of ASCAP and a customer’s previewing of ringtones were therefore licensable by the PROs. An interim fee 2009 decision regarding YouTube was a good example of the size of court set reasonable music license fee of $70,000 a month. The 2010 MobiTV case involved what a reasonable license fee should be for the delivering of television programming to mobile telephones and audio channels. In this case, the court returned to the early 1990s licenses of Turner Broadcasting which set a three-tiered license based on the music intensity of the program. The music intensive fee was 0.9% of defined revenue with a 0.375% for general entertainment and 0.1375% for news and sports programming. The 2nd Circuit Court of Appeals affirmed the lower court decision. All of the above cases were eventually settled with additional settlements made with Rdio, Spotify, Netflix, Hulu, as well as others. Two additional Rate Court cases, DMX and Pandora, involved not only the determination of reasonable license fees but also the role that Direct Licensing plays in the PRO licensing picture. Under the ASCAP and BMI Consent Decrees, the agreements that writers and music publishers sign with ASCAP, BMI and SESAC are non-exclusive- members and affiliates are allowed to directly license their works to a music user and bypass the PRO structures entirely. DMX is a leading background and foreground music service provider which provides pre-programmed music for business establishments via direct broadcast satellites or on premise delivery mechanisms. DMX hired a company to assist and design a Direct Licensing program with copyright owners which eventually resulted in direct licenses representing over 7,000 catalogues including one major music publisher, Sony. DMX was requesting from ASCAP and BMI a "through to the audience" blanket license which reflected the DMX direct licenses already obtained as well as those to be negotiated in the future. In July of 2010, the BMI Rate Court entered a final rate for the blanket license subject to adjustment of DMX's BMI performances directly licensed. In a separate decision, the ASCAP Rate Court ruled that ASCAP is required to issue to DMX a blanket license with "carve outs" for the direct licensing program. Both decisions were appealed to the 2nd Circuit Court of Appeals which in June of 2012 affirmed the Rate Court decisions. The resulting rates significantly reduced the license fees that DMX was paying to ASCAP and BMI. Pandora is the leading Internet customized radio service and is considered a non-interactive service as opposed to an on demand/interactive service where the user chooses what they want to hear. Pandora entered into license agreements with both ASCAP and BMI in 2005 and terminated those licenses at the end of 2010 and 2012 respectively. In the case of ASCAP, Pandora applied to the Court for a through-to-the- audience blanket license for the period 2011 through 2015. In the case of BMI, Pandora filed an application for a 5 year license commencing January 1, 2013. Based primarily on the small license fees that were awarded by the ASCAP and BMI Rate Court judges commencing with the AOL/Real Networks/Yahoo case in 2007, the major music publishers, starting with EMI (later acquired by Sony), notified ASCAP and BMI that they were withdrawing their catalogues for online licensing purposes. The majors felt strongly that they could negotiate more financially acceptable online value deals than the arrangements that had been set by prior Rate Court decisions and the subsequent settlements emanating from those decisions. These online media withdrawals were accomplished by specific changes in the rules, regulations and practices of ASCAP and BMI. Upon withdrawing their works, a number of the publishers entered into direct licensing deals with Pandora. In effect creating a system whereby Pandora had licenses with ASCAP, BMI and SESAC as well as short term negotiated direct performance licenses with the major publishers. Discussions were also held between ASCAP, BMI and the major publishers with a view toward ASCAP and BMI handling the administration of the online licenses negotiated by the publishers. In response to a Motion for Summary Judgment in September of 2013, Judge Cote, the ASCAP judge, ruled that a selective withdrawal of new media rights by publisher members could not be implemented without violating the Consent Decree and further that the ASCAP repertory subject to that license is all works in ASCAP at the time Pandora applied for a license (January 1, 2011)-not when the final license is arrived at. In short, an application for a license is treated as a license in effect and in this case no works could be removed during the period 2011 through 2015. And when works are finally removed by any publishers, those works have to be removed for all licensing purposes, not just for online licensing. In a similar Motion for Summary Judgment in the BMI case, Judge Stanton allowed the removal of works which occurred prior to January 1, 2013 but ruled that those works could not be licensed by BMI to any others after any existing license agreements expired. If BMI cannot offer those compositions to new media applicants, their availability does not meet the standards of the BMI decree and they cannot be held in the BMI repertory. The actual BMI Rate Court trial is set for December of 2014. On March 14, 2014, Judge Cote issued her "determination of reasonable license fees" 136 page decision in the ASCAP/Pandora Rate Court case. The judge ruled that the appropriate fee for the years 2011-2015 was 1.85% of revenue less certain deductions. ASCAP had requested a rate of 1.85% for 2011 and 2012, 2.5% for 2013 and 3% for 2014 and 2015. Pandora had requested a rate between 1.7% (the current traditional radio rate) and 1.85% (the ASCAP form rate in effect for Pandora since 2005). Subsequent to the decision, major music publishers and ASCAP separately filed appeals. Two of the more important issues in the Pandora Rate Court Proceedings involve the concept of the divisibility of copyrights which allow a publisher/copyright owner to make deals with various classes of users for their catalogue and the disparity in payments between artists and record companies and songwriters and music publishers for the same type of performance. As to the latter issue, the AOL/Yahoo/Real Networks 2007 Rate Court case provided evidence of the in excess of 30 million dollars paid by these services to the major record companies over a 2 year period whereas their fees to the PROs were, in comparison, very small. As to Pandora, the company expended in 2013 approximately 315 million dollars of its total revenue of 600 million dollars on Content Acquisition. Of that amount, close to 290 million went to SoundExchange for artists and record companies with all three PROS collecting a total of less than 25 million dollars for songwriters and publishers. As a point of additional reference, total 2013 limited performance right statutory royalties to SoundExchange were 650 million dollars in addition to significant record company interactive streaming payments whereas combined ASCAP, BMI and SESAC revenue for all new media uses was less than 100 million dollars. In July of 2014, ASCAP, along with Universal Music Publishing, Sony/ATV Music and EMI Music as intervenors, filed an appeal from the two District Court opinions with the U.S. Court of Appeals for the 2nd Circuit. The basis of the appeal was that the District Court erred in ruling that AFJ 2 (the Amended Final Judgment of 2001) prohibited ASCAP from accepting partial grants of public performance rights and that the District Court in setting a final license fee ignored recent arms length relevant benchmark agreements. As to the “Partial Grants” prohibition, ASCAP’s position was that the Consent Decree long ago removed any prohibition on the right of members to reserve for themselves the right to grant exclusive licensing rights to music users. Further, such a prohibition is in direct conflict with the exclusive rights provided by the copyright law to copyright owners. As to the issue of ignoring benchmark agreements in the setting of final reasonable license fees, ASCAP pointed out that the Sony/ATV Music, EMI Music and Universal Music Pandora direct license deals were all in excess of the 1.85% court set fee as was the 2013 negotiated ASCAP Apple iTunes radio license- all “arms length willing buyer and willing seller agreements”. Further, the 2nd Circuit, in its 2010 Yahoo, RealNetworks decision, confirmed that a 2.5% rate was a valid benchmark even though it vacated the District Court’s across the board application of that rate to all of Yahoo and RealNetwork’s services. Accordingly, the current District Court erred in ignoring the 2nd Circuit’s guidance in RealNetworks which established that a rate of 2.5% revenue (or higher) is reasonable for all-audio, music-intensive digital music services similar to Pandora’s. When songwriters, composers and music publishers join or affiliate with ASCAP, BMI or SESAC, they sign representation agreements granting to the PRO the right to license the non-dramatic public performances of their works. Though each PRO contract is different as to terms, length of contract, withdrawal of works and resignation/termination provisions, dispute resolution procedures, payments schedules and distribution rules, they all are non-exclusive agreements whereby the writer or publisher can license a work directly. The PROs cannot interfere in any way with this right or the ability to exercise this right. An issue in many agreements is what happens to the writer share when a copyright owner, usually the music publisher, directly licenses a work to a user. Clauses range from “payments to be made based upon the prevailing PRO rates for the specific use”, “compensation to be negotiated in good faith”, “reasonable fee”, “fee subject to arbitration”, “a complete buyout with no further compensation or continuing royalties” or “50% of any fee received”. A further unresolved issue as to an allowable and effective direct license under Court or Consent Decree interpretation involves the situation where a user goes directly to a copyright owner with the request versus the situation where the ASCAP or BMI copyright owner approaches the user to negotiate a direct license. A fine distinction but an important one in current litigation and Consent Decree interpretation. In part because of the Pandora decisions, a major development occurred in June of 2014 when the Department of Justice announced that they would review both the ASCAP and BMI Consent Decrees "to account for changes in how music is delivered to and experienced by listeners and if so, what modifications would be appropriate". The Department allowed a 60 day period for comments from any interested party (music publishers, songwriters and composers, PROs, online service companies, music users of any nature, the general public, etc.). A cross section of some of the views were illustrative of the issues as well as the diametrically opposed positions of many of the parties. The comments very much reflected a creators v. users scenario. On the music user side, the National Association of Broadcasters (NAB), the Digital Media Association (DiMA), Netflix, Fox News, the Radio Music Licensing Committee (RMLC), the National Restaurant Association and the Consumer Electronics Association, among others, submitted comments. The creator/copyright representative side included comments from the performing right organizations ASCAP, BMI, PRS for Music (U.K.), SOCAN (Canada), JASRAC (Japan), SIAE (Italy) as well as the Society of Composers and Lyricists (SCL – film and television composers), Nashville Songwriters Association International (NSAI), the National Music Publishers Association (NMPA) and the Screen Actors Guild-American Federation of Television and Radio Artists (SAG-AFTRA), among others. ASCAP, in its comments, requested that the Rate Court be replaced with a faster and cheaper dispute resolution procedure, that ASCAP be allowed to bundle and license multiple rights (the current Decree prohibits ASCAP from licensing any right other than performance) and allow partial grants of rights from its members. The arguments centered on the fact that New Media users need multiple rights in their business, that publishers need flexibility to manage rights and negotiate contracts terms and that property rights are divisible, assignable and licensable either in whole or in part. BMI, who are not prevented from bundling or licensing multiple rights, requested that publishers be allowed to withdraw digital rights and that a binding arbitration model replace the federal Rate Court alternative. The SCL (film and television composers and songwriters) expressed concerns that if the major music publishers withdraw completely from ASCAP and BMI, the transparency and accountability of the PRO collective licensing model would be affected and further that in a bundled rights situation it would be difficult to ascertain the value of the performance right in bundled transactions. Most writers in this field sign “work for hire” contracts where backend performance monies represent a substantial portion of their income. The 165,000 member organization SAG-AFTRA, the largest labor union representing working media artists, commented that the scales have tipped too far in favor of licensees’ interests over those of artists and that the rate setting process set forth by the Consent Decrees is inefficient, expensive and burdensome upon the PROs and if not modified will significantly devalue writers’ works. As to the foreign performing right organizations who submitted comments, widespread concern centered on the belief that the current Consent Decrees were outdated in today’s world and that changes were essential if music was to be appropriately licensed and compensated. Partial grants of rights and the bundling of multiple rights are commonplace in the foreign marketplace and dispute resolution procedures are less cumbersome than the U.S. Rate Court. PRS for Music in the U.K., which receives over 100 million dollars a year in U.S. performance royalties for its members from ASCAP and BMI, expressed concerns over the present Decrees and stated that they would consider licensing the British repertory directly in the U.S. rather than through intermediaries if it proved more efficient. DIMA, a trade organization whose members include Apple, Amazon, Microsoft and YouTube, stated that the Decrees have not harmed ASCAP or BMI financially in terms of the music industry generally, and that the PROs must be subject to oversight as their anti-competitive behavior continues to this day. Further, if the Justice Department does allow all the PROs to bundle rights as well as allow partial withdrawals, then substantial oversight must be put in place and that songwriters be allowed to keep their rights with their PRO if that’s what they wanted regardless of whether the publisher removed the works. The Radio Music Licensing Committee strongly felt that the Decrees were necessary to keep the market power of ASCAP and BMI in check. Also if publishers were allowed to withdraw from the PROs, they could leverage their outsize market share to extract exorbitant license fees from licensees. Both the NAB and Television Music License Committee also shared these views. As to Netflix, their position was that the Decrees were in place to constrain the PROs market power. They were against allowing partial publisher withdrawals but if the Department allowed them, then conditions would have to be imposed to mitigate any adverse consequences. Finally, the Rate Court must stay in place though it does need to be streamlined. It is important to note that there are numerous ASCAP, BMI, and SESAC voluntary negotiated agreements as well as settlements in the online area, including all of the aforementioned rate court cases with the exception of Pandora. These agreements include percent of music revenues as well as gross revenues, multiple revenue categories with different rates, different revenue percentages for on demand streaming, Internet radio and audio visual programming, gross revenue attributable to the service calculations, aggregate tuning hours calculations, flat fee deals, lump sum payments for past activity, different values assigned to a service’s different music uses as well as minimum fees, among others. All three organizations also have standard website agreements which can be accessed via each organization’s website. It should be noted that many of the ASCAP, BMI and SESAC agreements and settlements in the online world are confidential. Prior to 1972, no federal copyright protection existed for sound recordings. Congress rectified that situation by extending copyright to any recordings that were fixed on or after February 15, 1972. The owners of the copyright therefore had the exclusive right to reproduce and distribute phonorecords embodying the sound recording, including by means of digital transmission, and to authorize others to do the same. Pre 2/15/72 recordings remained subject to protection of state laws. As to the performance aspect of sound recordings, the right that was enjoyed by musical compositions was non-existent for records. No performance royalty existed in any medium. That changed in 1995 with the passage of the Digital Performance Rights in Sound Recording Act (DPRSRA) which provided for a limited right when sound recordings are publicly performed “by means of a digital audio transmission”. The 1998 Digital Millennium Copyright Act (DMCA) included webcasting as a category of performance applicable to this limited performance right. This new right applied specifically to satellite radio (e.g. Sirius XM), internet radio (e.g. Pandora) and cable television music channels (e.g. Music Choice). The applicable sections of 17 U.S.C. are 112 and 114 of the Act. Broadcast radio though remained exempt. It is important to note that the statutory license applies only to non-interactive services. The right to perform copyrighted sound recordings for on demand services (interactive services) remains with the copyright owner (normally the label) and is a negotiated agreement between the label and the user. The rates and terms of the sound recording statutory license are set by the Copyright Royalty Board (CRB), an administrative body created by Congress. SoundExchange, a non-profit organization, has been designated by the Librarian of Congress and the CRB to be the sole entity to collect, administer and distribute the royalties from non-interactive webcasting, digital cable and satellite transmissions and satellite audio services. Congress also gave SoundExchange the right to negotiate agreements separate from those set by the CRB through the Webcaster Settlement Acts of 2008 and 2009. Services therefore can choose whether to be licensed under the CRB rates or the SoundExchange negotiated rates. There are 5 major sound recording licensing categories each of which is subject to a separate rate proceeding. The categories are webcasting, satellite radio, pre-existing music services, other cable and satellite music providers and business establishments. For example, the rate proceeding for Sirius XM satellite radio concluded in 2012 and set rates for a 5 year period at 9% of gross revenue for 2013 increasing to 11% in 2017. Webcasting IV - the proceeding regarding webcasting – commenced in 2014 and will conclude at the end of 2015 and will set rates for the period 2016-2020. The most recent 5 year CRB per performance statutory webcasting rates were $0.0019 for 2011, $0.0021 for 2012 and 2013 and $0.0023 for the years 2014 and 2015. The Webcaster Settlement Acts of 2008 and 2009 allowed SoundExchange to negotiate alternative royalty rates (“Pureplay” rates) with certain webcasters. For non-subscription services and broadcaster’s streaming their content on the internet, the “Pureplay” per performance rate started as $0.00102 for 2011 and increased to $0.0013 in 2014 and $0.0014 in 2015. The rate applicable is the greater of the per performance rate or 25% of U.S. gross revenue. The “Pureplay” rate for subscription services started at $0.0017 in 2011 and increased to $0.0023 and $0.0025 respectively for 2014 and 2015. No percentage of revenue figures applied to the subscription rate. Under those agreements, Webcaster therefore had a choice to be licensed through 2015 either with the CRB rates or the SoundExchange “Pureplay” rates. As to the Webcasting IV SoundExchange rate proposal for the 2016-2020 period, they submitted to the CRB a “greater of” formula taking into account a per performance rate and a percentage of revenue. Specifically, the per performance rate for commercial webcasters would commence at $0.0025 in 2016 with escalations to $0.0029 in 2020. The percentage of revenue would be 55% for all five years. Their proposal was based on the fact that webcasting is a vibrant and growing industry, that it has widespread adoption by consumers and that direct licensing deals between record companies and on demand services were the most appropriate benchmarks to use. A review of these deals confirmed that the record companies received a minimum share of 50%-60% of a services revenue with allocations based on each record company’s share of total streams. SoundExchange collected $650 million in 2013 pursuant to the statutory license and distributed in excess of $500 million to artists and sound recording copyright owners. 2014 collections are projected significantly higher. Royalty distributions are allocated 50% to sound recording copyright owners (many times the label), 45% to featured artists and 2.5% each to non-featured musicians and non-featured vocalists via the Intellectual Property Rights Distribution Fund administered by AFM and SAG-AFTRA. An additional $6 million was collected from foreign country collection societies who handle the performance right of the sound recordings. As to this latter collection, it is limited based on the reciprocal right being administered in each country non-interactive streaming. In the case of rights owners wishing to directly license their works to non-interactive services and not rely on the statutory license, SoundExchange does offer administration services to both labels as well as artists. As previously mentioned, sound recordings fixed prior to February 15, 1972 are not subject to copyright under 17 U.S.C. and further that any rights they do have depend solely on whatever rights are afforded to sound recording owners under state law. In September of 2014, in the United States District Court Central District of California case entitled Flo & Eddie Inc. v. Sirius XM Radio Inc., the court ruled in a motion for summary judgment that copyright ownership of a sound recording under the California statute includes the right to publicly perform the recording and that Sirius XM’s streaming of the Turtles’ pre-1972 recordings without authorization and without paying royalties constituted copyright infringement. Of the three areas of music licensing under discussion, two of the three (mechanicals and sound recordings) seem clear, with the third (performances) uncertain as to a number of important issues and practices. In the mechanical licensing area, rates for physical product, digital downloads, ringtones, interactive streaming and limited downloads have been set through 2017 with an additional five new configurations now covered. In the area of the limited performance right in sound recordings, CRB rates for cable, satellite and webcasters are in effect through 2015 with SoundExchange separate negotiated rates extending also through 2015. For rates commencing 2016 and beyond, a Copyright Royalty Board is currently underway (Web IV). Also, payment formulas are in effect as to distribution of royalties to record labels, featured artists and non-featured musicians and vocalists. Reciprocal agreements with foreign country collection societies are also in effect at least as to coverage afforded by the U.S. limited right (non-interactive webcasting, etc.). A remaining open question involves whether this limited right sound recording right will be extended by legislation to United States terrestrial(traditional) radio broadcasting- a "neighboring" right in effect in most other major countries of the world. Such an extension would significantly increase artist and record company royalties both in the U.S. and in foreign countries. The performance area of ASCAP, BMI, and SESAC though, remains in a state of flux with multiple different license fee negotiated and standard form formulas in effect in addition to rate court decisions and settlement agreements with various major players including AOL, YouTube, AT&T Mobility, Verizon Wireless, Ericsson, Spotify, Netflix and many others. Also, the current Pandora ASCAP and BMI Rate Court proceedings are not as yet final in addition to the Department of Justice reviewing the ASCAP and BMI Consent Decrees which could significantly affect licensing rates and strategies as well as significantly increasing or decreasing the complexities of licensing music. As to Direct Performance licensing, around since at least the 1950 ASCAP Amended Consent Decree, the issue is in the forefront again as a result of the ASCAP and BMI Rate Court cases involving the background music supplier DMX as well as the online music service Pandora. As you can see, rate courts, royalty boards, litigation, legislation, industry practice, foreign country considerations, the Justice Department and voluntary agreements all have a role in determining what is actually licensable in the online world as well as how much money is being made by writers, artists, music publishers and record companies. This is a revised and updated version of an article that first appeared in the American Bar Association ENTERTAINMENT and SPORTS LAWYER (Forum on the Entertainment and Sports Industries). Todd Brabec, former ASCAP Executive Vice President and Worldwide Director of Membership, is an Entertainment Law attorney, an Adjunct Associate Professor at USC, a Governing Committee member of the ABA Forum on the Entertainment and Sports Industries and co- author of "Music Money and Success: the Insider's Guide to Making Money in the Music Business"(7th edition/560 pages/Schirmer Books). 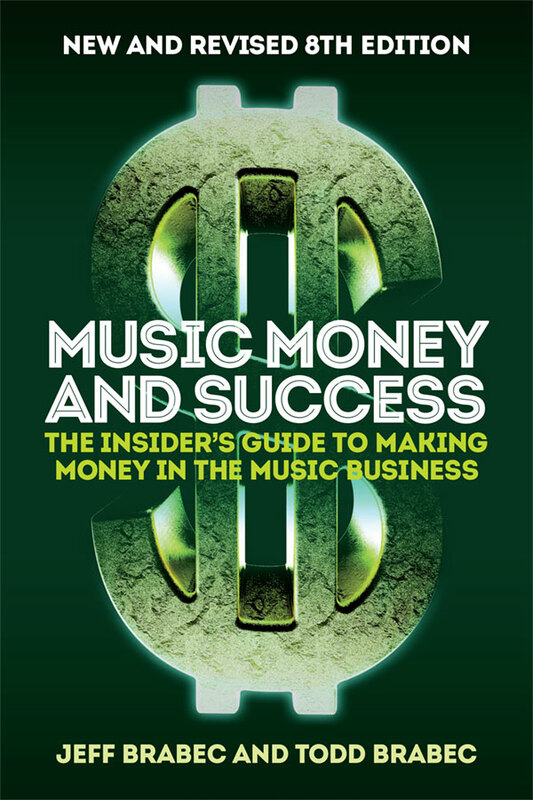 Jeff Brabec, is Vice President Business Affairs for BMG Chrysalis, an Adjunct Associate Professor at USC and co-author of "Music Money and Success".